At work I’m in the midst of setting my 2012 performance objectives. I’m not good at this. Or is it that I just don’t like doing it. Or that my high expectations make achieving them a stretch. Or all of the above. Well I resolved on my long Saturday morning run that goal setting is good, for my running at least. Having something to shoot at helps stay motivated. Now the first step in goal setting, according to the management gurus, is to take stock of the past year. 2011 was a mixed year. The year ended on a high note with a mention in the Running Times annual master’s M45-49 rankings and a nomination from NYRR for M45-49 runner of the year 2011. Meanwhile my US results got me ranked top 3 in the M45-49 age group in the UK for the 5 mile, 10K and half marathon. Most satisfying races included: finishing second M45-49 in the British Masters Cross Country Championships; first masters in the Bolder Boulder 10K; and running 1’10″48 in the Philadelphia (aka Philly) Rock ‘n’ Roll Half Marathon. Team performances also matter. I raced regularly for my club Warren Street Social and Athletics Club but we had to settle for 3rd in the NYRR 2011 Team Awards for masters having been the top team for the previous three years. A major disappointment was not being selected to represent England in the British and Irish Masters Cross Country International, with lack of ‘local’ races cited as a reason. As a UK expatriate living in the US I’m falling (running) between two stools. Here in the US I can compete, but am ineligible to score, in the USA Track and Field Championships – as I found out at the USATF Masters Half Championships 2010 in Florida. 2011 brought with it the realization that age is catching up with me. Injuries are easier to come by – I have been battling with IT Band and groin issues – and younger runners harder to beat. PRs are illusive and largely confined to race distances never previously attempted. At 46 I have to be realistic. Masters runners have to redefine success: doing the same as before is the new improvement. Age grading helps. By the end of my 2′ 30″ run I had decided on the following goals: stay injury free and continue to run about 70 miles a week; run a 70 minute half-marathon, maybe Philly; get as near to the top of the UK and US masters rankings as possible; win the NYRR M45-49 age award to make it eight in a row; and help the team improve in the club rankings over 2011. If the stars start to align and a PR looks possible (my 2:29:56 PR was set in 2006 in London, just after turning 40), then run the New York marathon, my hometown race. 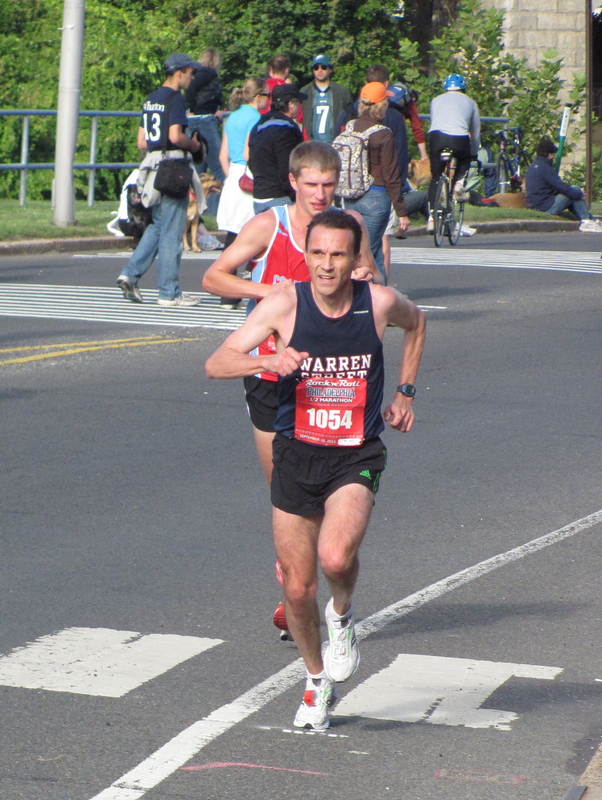 Another running goal is to help some of my Warren Street team mates set PRs in 2012. If I cannot set one then at least I can help someone get one. Team mates that look likely to set PRs this year include Danny Tateo, Sebastien B., Lauren Salisbury, Fabio Casadio, Charlie Baily and Mo’ath Al-khawaldeh (for their NYRR race results see here). One last and possibly most important goal: to continue to feel that I have to run. There’s no better motivator than that.